Game of Thrones Season 6’s Battle of the Bastards alone won an Emmy for its VFX and cleaned up at the Visual Effects Society (VES) Awards in February. 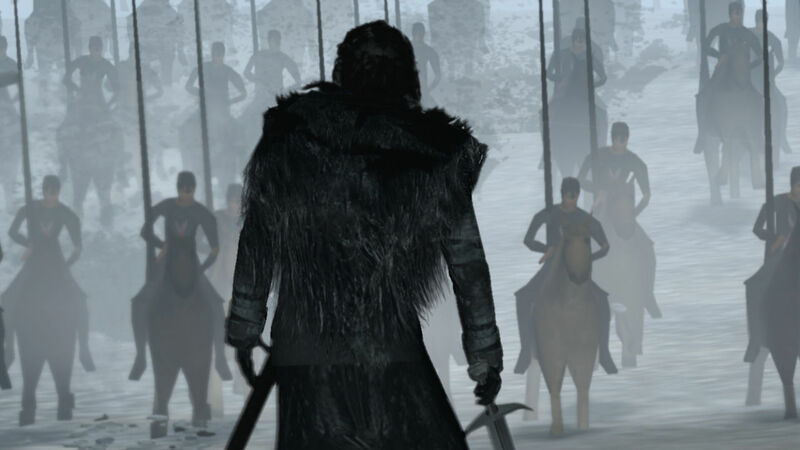 The episode was nominated for nine VES awards, and won five – Outstanding Visual Effects in a Photoreal Episode, Outstanding Animated Performance (Drogon), Oustanding Created Environment (Meereen City), Outstanding Effects Simulations in an episode, commercial or real-time project, and outstanding compositing in a photoreal episode (retaking Winterfell, the actual battle). 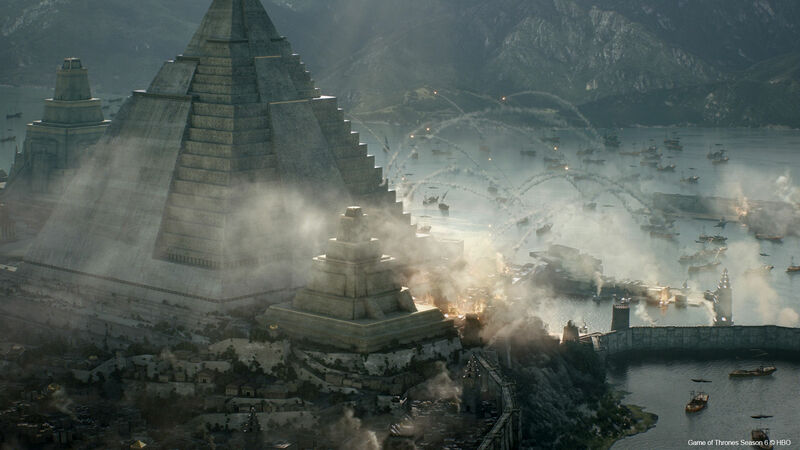 Battle of the Bastards included both the eponymous battle between huge armies led by Jon Snow and Ramsay Bolton – which featured VFX by Iloura – and an earlier battle at Meereen with flaming cannonballs and a giant pyramid – which saw work shared between Rodeo FX and Rhythm and Hues. Pre-viz work on both sequences was done by The Third Floor. Illoura and Rodeo have both shared video breakdowns of their VFX work. We'll start with Illoura before moving onto Rodeo FX - finishing up with some info just provided to us by The Third Floor. Visual effects studio IIoura unveils in this video just how much of that massive, gory battle in the penultimate, pivotal episode of Game of Thrones’ sixth season was created with CG. 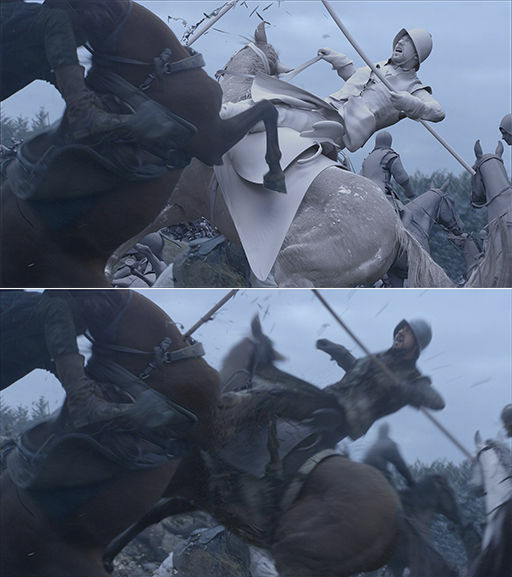 On the VFX to-do list was: photorealistic horse and rider collisions, 3,000-strong armies, both live action and CG close-ups of humans and animals, massive crowd simulations, as well as hundreds of assets from CG armoury and weapons to blood and fire. Phew. VFX Producer Steve Kullback and VFX Supervisor Joe Bauer quickly enlisted the help of IIoura – and soon hundreds of extras were surrounded by thousands of CG creations, a normal-sized man grew into Wun Wun the Giant and beaten-up CG horses started to regret ever being created. Together, they researched horse behavior in steeplechases, jousting, racing and all manner of accidents to make the shots as realistic as possible and provide the animation team with multiple reference angles for actions. Iloura tapped its large library of animated clips to quickly assemble a blocking pass for shots, which became the foundation for animation that ended up on screen. “We are up close and personal in this battle with CG horses,” said Steve Kullback. “And collisions right in front of the lens and we constantly needed to review Iloura’s shots side by side with the photography because it was hard to remember and even harder to see the difference between what was shot and what was added." The animation work involved motion capture, rotomation and key frame for horses, as well as soldiers. This built into a library of custom interactions and motions used for both close-up and the massive crowd shots built in the crowd-building software Massive. Each army comprised smaller factions with custom armour, weapons, flags, banners, saddles, bridles etc - and every asset needed a clean, pre-battle version as well as a muddy version, a bloodied version and the very-muddy-very-bloody variant that Game of Thrones is loved and feared for. Rodeo FX created FX simulation of flaming cannonballs shot from ships in the harbour, while CG smoke and particles filled the air. "The destruction of the ships was a huge undertaking as we had to model a completely different version of our asset for this scene," says president of Rodeo FX Sebastien Moreau. Then Dothraki Horde comes to the rescue, Daenerys climbs on Drogon, flies across the Meereen gates and gets the dragon to breathe fire to destroy the ships. Rodeo FX completed 65 shots during this episode, and shared many with Rhythm & Hues – the studio behind the dragons. Rodeo FX also simulated sails, water and fire, and used matte painting to fill details in the skies, distant mountains and cliffs. The visual effects company has also worked on feature films The Legend of Tarzan, Warcraft, The Walk and The Hunger Games: Catching Fire and the opening sequence for NBC’s NFL Super Bowl in 2015. It won Visual Effects Society (VES) awards for its work on Game of Thrones and Birdman. The Third Floor provided pre-viz work on both Mereen and the Battle of The Bastards itself. The studio created low-res mockups of intricately choreographed scenes that allowed those working on the show to map out in advance how they wanted shots to appear - and plan how they would make them with a mixture of live-action footage and CG. "Working from storyboards, [our] artists visualised layouts for the battlefield, including huge armies that were created using groups of low-res cached previs models with varied animation cycles for archers, cavalry and soldiers populating the fields. "The action was then broken down into action beats, using specific battle formations and various camera shots (wide shots, crane shots, vehicle-mounted shots) to establish the geography for viewers and ensure hero characters remained visible in the crowd. Previs artists also worked with the art department on layouts that guided placement of props and piles of bodies at the physical shooting set. 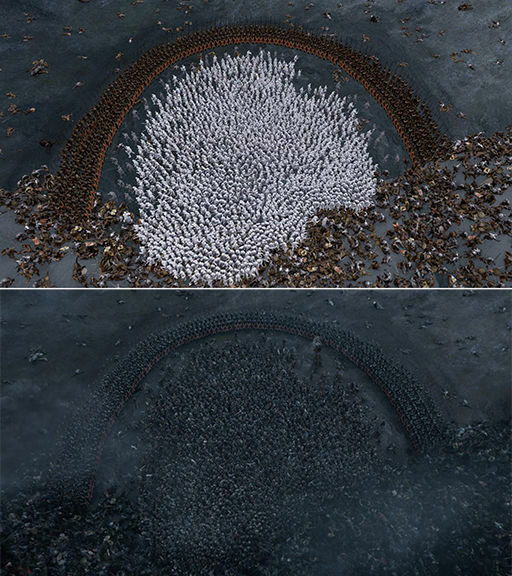 "The 'one’r shot,' which stays on Jon Snow in thick of the fighting through a series of obstacles and close calls, required particularly close-crafted choreography. Each pass required for the multi-layered final composite was mapped out with colour-coded diagrams and Quicktimes to show what would need to be shot using practical cameras, stunt elements and CG effects. "Another challenge was the presence of the giant Wun Wun amidst the fray. All shots including the character - played by a real actor - required a secondary plate shoot and all of the main plate shoots needed to account for the giant’s virtual position for natural interaction and eyelines. 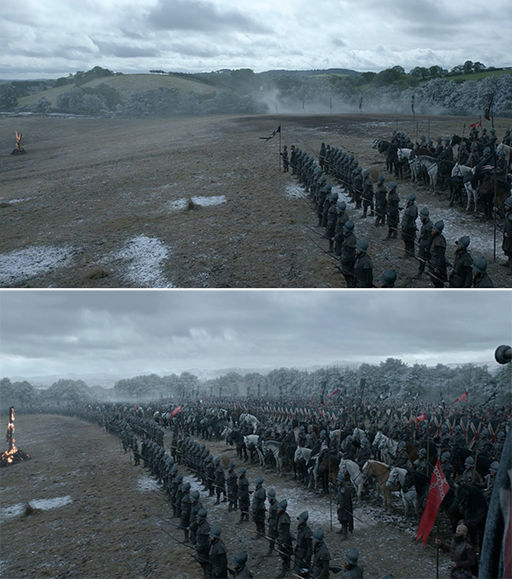 [We] calculated the height and position of the absent character and [this] was used in designing shots and seamlessly believable coverage using both full-scale and miniature-scale Winterfell sets." 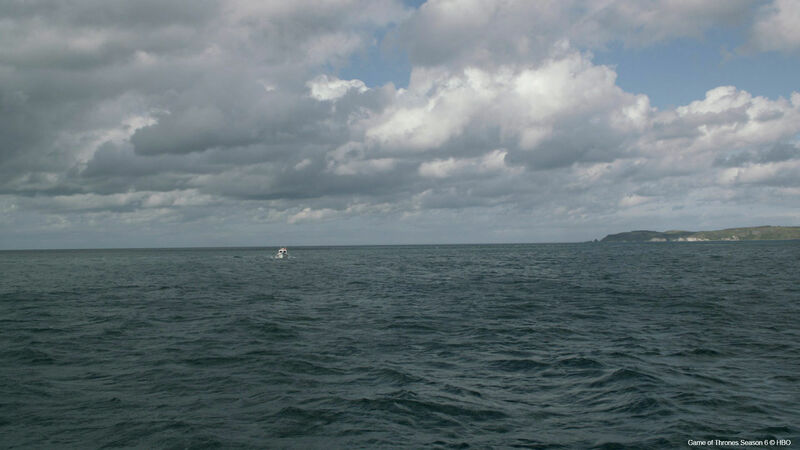 The team's pre-vis work also made planning the attack on Slaver's Bay earlier in the episode easier. "The Slaver’s Bay Attack involved all three dragons, the fictional city of Meereen and shooting locations from Spain to Belfast. [We] modeled the environment in pre-viz, ensuring the various geographic locations could be tied together with the CG world and that the animated CG dragons would be able to swoop and land, interacting in real-life locations. Shots of Dany riding Drogon were done in a separate greenscreen shoot with moves established in pre-viz used to program the physical motion base. 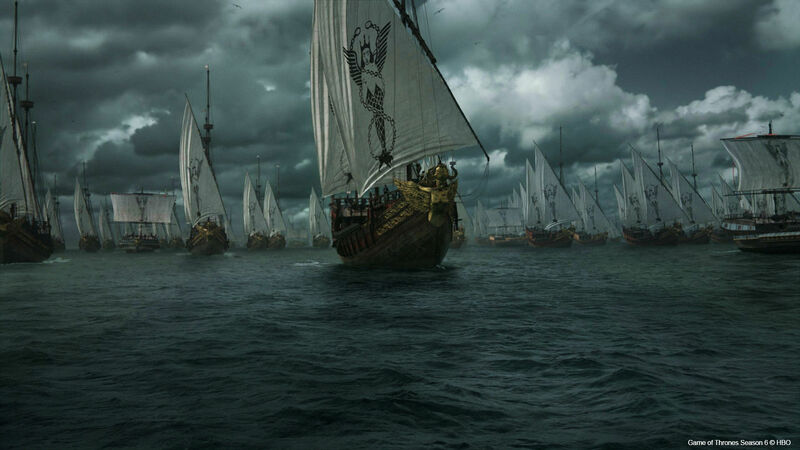 "Shots of the dragons attacking the ships were previsualized with Joe Bauer. [This] helped determine requirements for the camera cranes and greenscreens used on the Banbridge exterior set. Wide shots of Meereen were visualized by incorporating real location elements such as the castle walls from the Muralla at San Cristobal in Spain. These architectural elements were shot using drones and utilized techvis data for flight paths and speeds as well as lens information."